The best Matcha tea is both soothing and invigorating, with hints of florals and grassy notes. While Matcha tea is produced and shipped all over the world, there is a very wide range in quality. That’s why our reviewers took the time to find 10 of the best high-quality Matcha green teas and introduce them to you below. Now: here is what you need to check for as you search for the best Matcha tea on the market. Type - Popular Matcha producers create teas in bags or pods for steeping. Other teas arrive as a very fine green powder, which requires a different method of preparation. We’ll tell you what type of tea you are purchasing right away. USDA Certified - “USDA certified” indicates government review, and certification, of a company’s wares. Any organization involved in food production can be certified, including farmers and retailers. When marked “Yes,” it’s an additional verification that what you’re buying is an organic tea. Weight - Noting the ounces of tea per purchase is an easy way to estimate how many servings of Matcha you’re getting. The ratio is about 1 teaspoon of Matcha for every 6 ounces of water, so a little goes a long way! Made In - Japan, China and India are all major producers of Matcha green tea. It is a tea growing in popularity across the globe. With this category, you can find out at a glance where your tea of choice is grown. Container - The best Matcha green tea must be kept fresh, so the container is pretty important! Some tea producers ship in bags or boxes, while others will ensure that all packaging is re-sealable. Take a look here to learn more container information. Now that you know what to check for when shopping, let’s get right to the reviews. Here’s the scoop: these teas are all fragrant, delicious, and a new and original way to start your day. If you’re in a rush, no problem. Just look at our top pick and our budget pick. They are both excellent choices for a hot cup of magical green tea. If you’re looking for the very best Matcha, chances are it’s on this list. Let’s get started! Tea lovers across the globe know Matcha Green Tea is not a new thing, but it is currently extremely trendy. And for good reason! It’s extremely healthy, with one of the highest antioxidant counts of any beverage. If you want to experience this drink for yourself, you need to do it right by purchasing authentic ingredients. The best Matcha tea is on this list, thanks to our expert reviewers. Their top pick is Greenhilltea Ceremonial Matcha Tea. 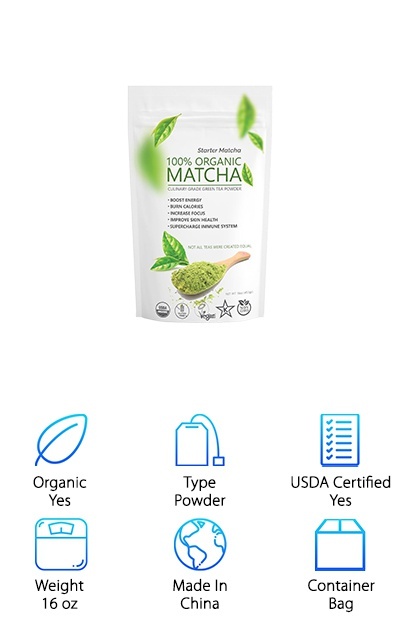 Here’s the deal: 4 ounces of the organic Matcha tea powder will arrive in a small bag, ready to be whisked into hot water. The aroma is described as grassy and vegetal, with creamy, sweet floral notes. Whip up a cup for yourself every morning, and create a routine to be savored. All of your friends will point out your new aura of zen. Let it help to center and calm you, and start your day off right. This product is USDA certified! Matcha green tea is a beverage packed with antioxidants and noted for its many physical health benefits. It can be made hot or cold, iced or blended, and coffee and tea shops everywhere are adding it to desserts, baked goods and more. The best Matcha tea brands are not overpriced or hard to make at home. Lipton Magnificient Matcha couldn’t be easier to create in the comfort of your own kitchen! Even better: It’s all of the benefits of a Matcha tea habit combined with the ease of dunking a tea bag into a mug of hot water. 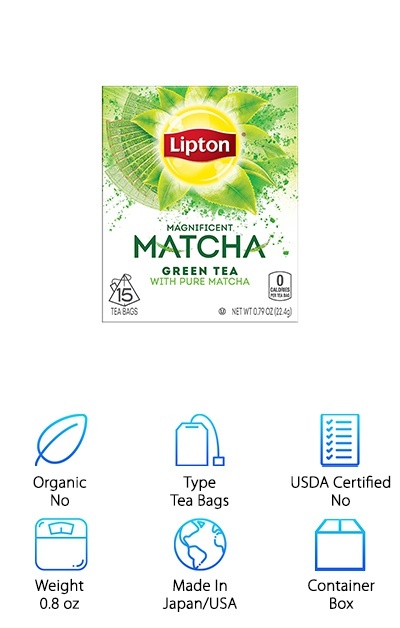 Lipton blends authentic Japanese Matcha tea with green tea to create a drink that’s ready to go in just a couple of minutes! No need to buy a bowl and a whisk, and this is a very affordable product to boot. Add a cup of delicious green tea to your day to reap the gains of this tasty little tea bag. The best Matcha green tea review includes the right ingredients to get you started on your journey of self-discovery. Legend has it 12th-century Buddhist monks drank Matcha daily to assist with focus during meditation time. Now the refreshing drink is back in a very big way, featured everywhere from big-name coffee houses to corner bakeries. If you want to learn more about the trend, you’ve come to the right place! Matcha has a number of noted health benefits, including antioxidants and a caffeine buzz that’s less jolting than coffee. And with the VitaCup Matcha Green Tea, your cup will be ready in minutes – just place the pod in your coffee maker and press Start. These pods come 16 to a box, and each pod contains two servings of blended Matcha and green teas. This is a healthy habit we can get behind! 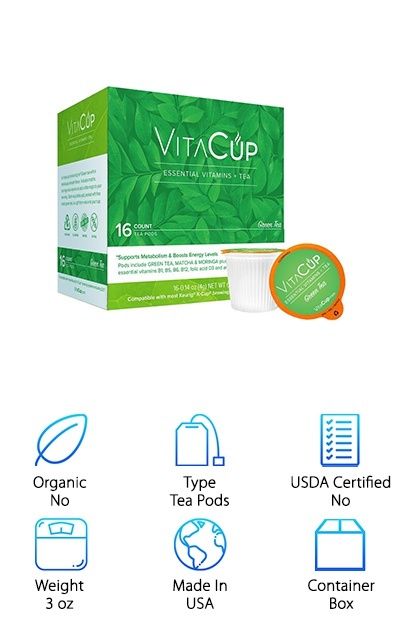 Start today and discover the calming simplicity of a good cup of VitaCup Matcha Green Tea. Superfood health benefits and a connection to a ritual dating back hundreds of years. That’s the appeal behind massively popular Matcha tea! 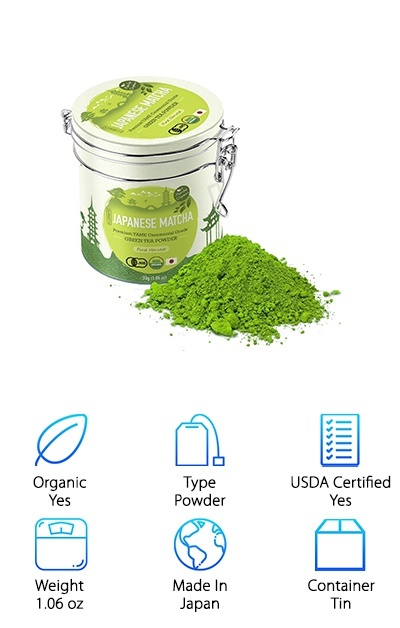 The best organic Matcha tea hails from either Japan or China, like this MatchaDNA Certified Organic powder. You might be wondering: why are people so crazy about Matcha? It isn’t just good for you on paper. It’s actually a delicious, delightful drink. Make it hot or cold and customize away. Add honey, milk, half n’ half, or place the powder into your favorite fruit smoothie. MatchaDNA’s powder comes in a sealed 12-ounce bag straight from China’s Fujian province. This is a fully organic product, and it’s also USDA certified. Each serving is half a teaspoon, and with a 12-ounce product, this tea is going to last you a long time. Try it in your baked goods, or add it to your favorite homemade face mask. It’s that versatile! Find your happy place with a fragrant cup of MatchaDNA tea. We are often told to be more mindful in our everyday lives – to savor the moment, the food we eat, the drinks we drink. Perhaps that’s why Matcha green tea has become so hugely popular in recent years. Think about it: the act of preparing a lovely cup of green tea from Jade Leaf Matcha Powder can be a near-religious experience. The water is heated, and then the powder is measured and placed and whisked into a creamy froth with a golden-green color. To make a Matcha green tea latte, you can stir in some hot milk and honey or agave syrup to add nuance to an already-delicious beverage. Sit back, relax, close your eyes and sip. It’s a little bit of serenity in a chaotic world. 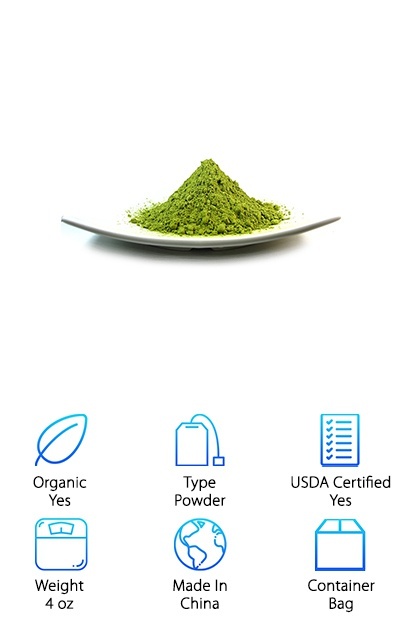 It gets better: This powder is made from authentic Japanese Matcha, from a single estate family farm in Uji, Japan. It's a fully USDA certified, organic product. What are you waiting for? A regular morning routine can start every day off the right way. A little meditation, some stretching, and a warm cup of Drink Matcha Green Tea Powder can be invigorating on a Monday. Doesn’t that sound perfect? So, what’s the secret? Matcha is renowned for its nutritional content. It’s loaded with antioxidants, and has a mild caffeinated kick! The gorgeous green hue, and mild scent ranging from lemon to melon, will wake up your taste buds and put a smile on your face. 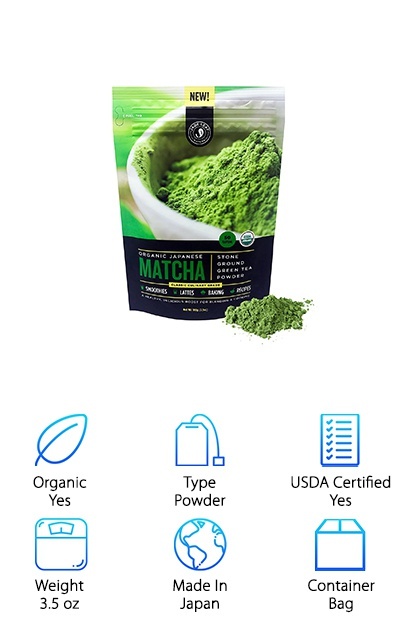 There is a very wide range of Matcha products out there, and our reviewers selected ten of the best, including this one! 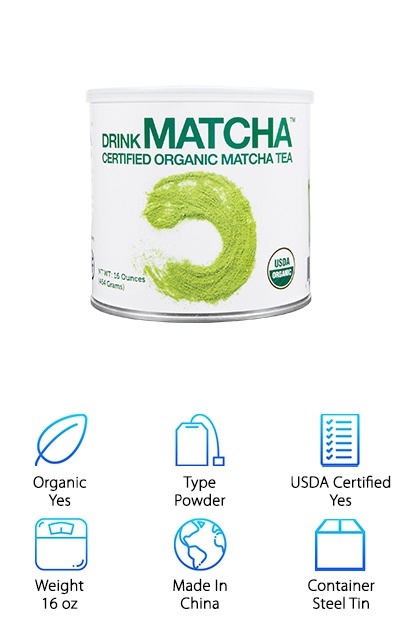 Drink Matcha Green Tea Powder comes in a large steel tin, with 16 ounces of powder ready for baking or drinking. You’ll smell the freshness as soon as pop the lid! This is organic and USDA certified, so you know you’ve selected the very best of what’s available. It’s time to pick up a great new habit! Matcha is produced and sold all over the world, but quality varies widely. That’s why our reviewers want you to try this Distinctly Organic Matcha from Japan. It is ceremonial-grade, which means it’s the best of the best. “Ceremonial” refers to the ancient Japanese tea ceremony using Matcha. It is a ritual meant to bring people together, and focus on the present. If the tea powder is ceremonial-grade, it's very high-quality. That vibrant green color is another indication that you've found an excellent Matcha tea. It's also an organic, USDA Certified product. All you need is half a teaspoon of this powder, blended or whisked into a few ounces of hot water. Sip, and enjoy. Since each container has 1.6 ounces of Matcha green tea powder, that’s about 30 servings! Matcha is a great natural source of energy, and it’s loaded with antioxidants. While this drink may not bring you enlightenment, it could bring more happiness to your day. 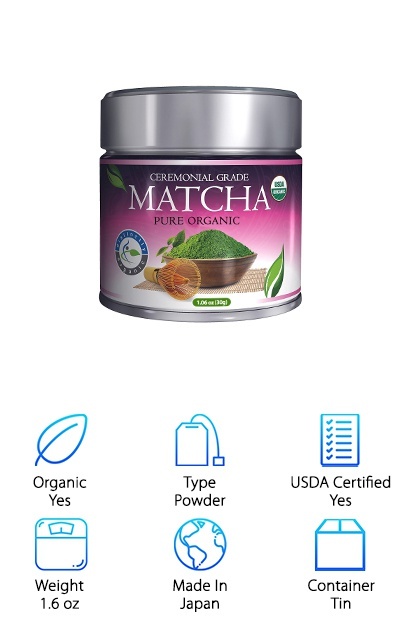 There are two types of Matcha green tea that are normally available for purchase: ceremonial and culinary-grade teas. Matchaccino Starter Matcha is a culinary-grade item, perfect for everything from baked desserts, to savory dishes, to at-home beauty routines. Here’s one example: blend some of the matcha powder with honey and banana to make a rich, moisturizing face mask! This affordable powder comes in a 16-ounce bag and can last you a long time. It makes a delicious, frothy green drink beloved by millions. Just add half a teaspoon to hot water to dissolve. If you prefer an iced drink, dissolve and then add cold water, ice or milk! A tea ceremony can help introduce calm and focus into your day, not to mention the many health benefits touted by the growers of this tea. 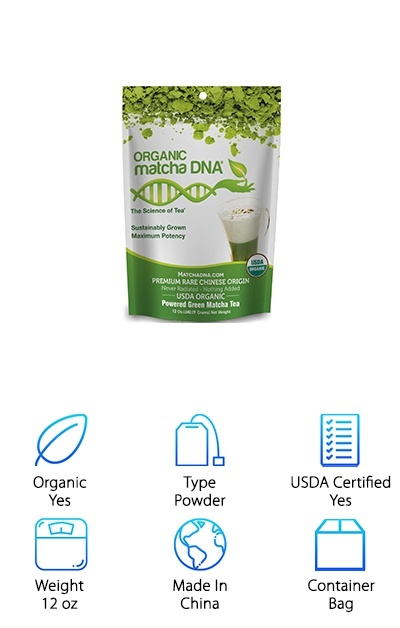 As with many of our favorite Matcha green teas, the Matchaccino Starter Matcha is an all-organic powder. It is USDA certified and comes from China. It’s a little-known fact that both Matcha tea and green tea come from the same plant. Both are made from Camellia sinensis, but the comparison stops there. Matcha green tea is shade-grown for several weeks, and then harvested and steamed by hand so that many of the nutrients are retained. The leaves are then air-dried, and ground into a fine, bright-green powder. Most other teas are rolled, pan-fired or heated in the drying process. 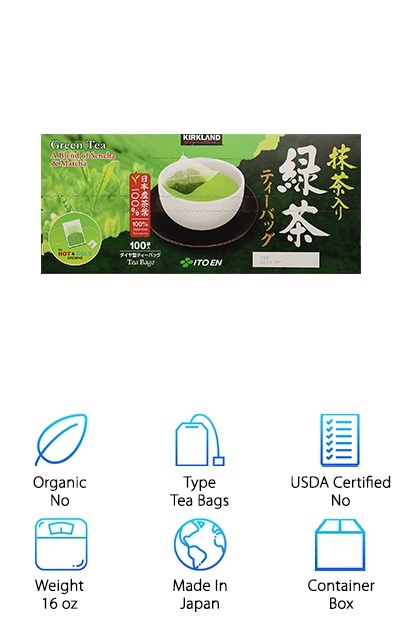 Many of the most diehard fans of Matcha green tea will tell you that the best tea product comes from Japan, where the Matcha ceremony originated. In this case, we have selected one of the best of those Japanese-made teas for you. This Premium Japanese Matcha is a winner. It is USDA certified and organic. You get just over an ounce of ceremonial-grade Matcha, or about 30 servings. This lovely tin makes the tea easy to store and will help to keep it fresh! Want all of the benefits of a nice cup of green tea, available to you in just a minute or two? The Kirkland Ito En Matcha Blend comes ready to go in a box of 100 tea bags. That’s right, every box contains 100 servings of Japanese green tea! The tea is a blend of two varietals, Sencha and Matcha. Matcha is the bright green powder lauded for its health benefits, and Sencha is what we know as the classic green tea. Together, these two versions create a fragrant, stimulating beverage perfect to help you wake up and start your day, or relax in the afternoon. Here’s the deal: just like any other bag of tea, this one needs just 30 seconds steeped in a mug of hot water. Turn it into a latte, pour it over ice, and craft your perfect drink. Combine the tea with some yoga or some meditation, and you’re on your way to becoming a 21st-century guru.